“Everything seems to be governed by the Lord of the Universe” is the conclusion that Chris Tarantino reached when deciding to accept Islam. “How could I not?”, the man born in Kissimmee, Florida, did not take the slightest to pledge the creed. It all started with war. Yes, war. Chris enlisted with the US Army in 1998, three years before the September 11 attacks in New York and Washington DC. He was deployed to fight in Afghanistan and Iraq. American soldiers fighting in Muslim countries often face negative perceptions that they are enemies of Islam and Muslims. But Chris said he never had positive or negative feelings about Muslims, even when heading to Iraq. “All I knew was we were going to combat terrorism. As a soldier, I just did what I was told. They say ignorance is bliss. I guess I was ignorant.” he said. Chris’s assignment to Iraq in 2006 was going to be the first step in his journey towards Islam, even though he did not realize it. His wife, Cristina Tarantino, who at the time was in Mannheim, Germany. She was so worried about her husband that she began to reflect about life and death. “I was really, really scared something was going to happen to him,” she said. She started to wonder what really happens to us after death, and what is the best way to live life in this world. Cristina had an older sister who had converted to Islam after marrying a Palestinian man. She started spending time with her and asking questions about life and death in Islam. What she was hearing from her sister made sense to her and gave her some serenity. This was the start of a spiritual journey that she shared with her husband during frequent phone calls while he was stationed at Camp Taji in Iraq. Chris could not hide his surprise when his wife said she had accepted Islam: “I was kind of shocked when I heard her say it — ‘I’ve accepted Islam,’”, he said. the first question he asked her was whether she had started wearing Hijab. At that time, Cristina said she was not ready for that yet. Chris didn’t ask his wife a lot of questions but instead “I asked for guidance in my prayers.” he said. 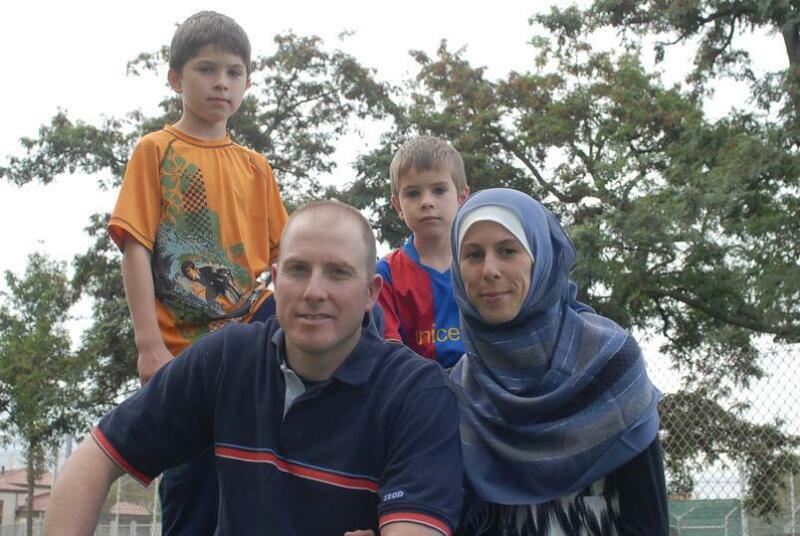 A few years later, when he was reassigned to Iraq in 2010, Chris had finally become a Muslim. He decided not to hide it. “I saw it wasn’t the end of the world to say I was a Muslim,” he said. Over time, the couple became increasingly religious. They often visit a Sunni mosque in Mannheim. Soldiers who convert to Islam face a double dilemma: at work they face perceptions that Muslims are hostile to the military they serve, and at the mosque they face perceptions that they are ennemies of Islam. But his situation is unusual: He is the only US soldier at the Omar Al-Faruq Mosque in Mannheim, part of a small minority of Muslims in the military and an even smaller minority of Muslim soldiers who are not from a traditionally Muslim family or African-American. Although Chris and his wife’s decision to embrace Islam is personal, not political, his views on the wars in Iraq and Afghanistan, and war in general, have changed. In just a few weeks, this charity has collected and sent 135 tons of food and medicine. All assistance is collected, arranged, and carried out during Ramadan. But her husband has never had a problem interacting. Soldiers in his unit know he is a Muslim. Chris can take time to pray. “I’d stop for prayer. I’d talk to them about Islam because it’s my chance to do a good deed,” he said. “At first, they were - “What?” “You are?” “Really?”’ he said. After, they’d say, “Sgt. Tarantino, it’s prayer time.’ They were respectful,” he said.